The donation site we have chosen to use for our organization, Network for Good, does not allow donations for when you receive something of value in return for your donation. So please use a check or money order and the good ol' US Postal Service when ordering programs, and ask us for more information about the value of the DVDs/tapes and your accountant about what is tax deductible. In August 2012, we launched an on-line Computer Campaign to raise $2000 toward purchasing a refurbished Macintosh Intel tower. We are so grateful to the people who responded, donating a respectable $875 toward that goal. In early January, we used these funds to purchase the Mac Pro Tower we sought! We still need a bit more money to pay for peripherals such as hard drives, connectors, etc. to integrate the computer into our existing system. We are continuing to accept donations by mail or on line . Flying Focus has produced the vast majority of its over 800 programs at Portland Community Media with equipment available to anyone in the public, using digital video tape. With technological advances moving toward digital files and editing, we found it more difficult to keep up with technology. 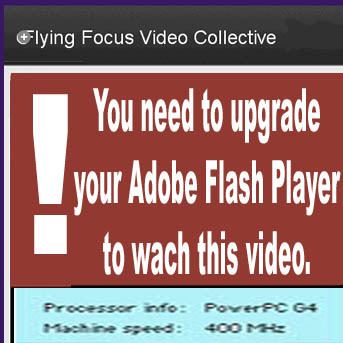 The release of a version of the Flash animation program in 2011 which was no longer compatible with the older computer drove home the point that the group would need to upgrade, if only to watch one of our own clips on line. The suggested donation for most of the videos is listed beside each video inthe catalog. NEW! In 2012, we dropped to suggested donations by $3 per item; those items formerly $11 (1/2 hour shows) are now $8, $14 items (1 hour shows) are now $11, and $17 items (over 1 hour) are $14. Starting in February, 2005, we began offering our programs on DVD ; since 2007 the suggested donation has been the same for DVD or VHS . with a two-part episode (1 hour) at a suggested donation of $11 . Similarly, any one-hour program is available for a $11 donation, and longer programs are $14 . About half of the SE (Speakers and Events) programs are 60 min/$11 and the others are 90-120 minutes for $14 . Many of the ZMI (Z Media Institute) shows are 90 minutes for $14 . We generally will offer the videos for a lower suggested donation if yousupply us with tape/DVD stock. Orders can take up to 4-6 weeks to fill. Orders of over 10 videos may take longer. Please prioritize any such order if you can. Note that there is a hard copy of our updated catalog availableif you send us your snail mail address. and to document events and groups which may beimportant to you. Thank you. Please include $4.00 for postage & handling for the first two videos, and $1 per video after that. Titles are not in stock and each video has to be duplicated by hand, VHS in real time and DVDs in 1/2 time. We ask for your pre-paid donation before copying the videos. Costs and time frame may vary if you have special needs, such as colorbars, formats other than VHS (SVHS, 3/4", etc), or specific audiorequirements. Please let us know. In 2012 we began offering streaming rights to our programs: $75 per program for individuals/non-profits and $125 for larger institutions. Contact us if you are interested in seeing a particular program being made available on line! Please contact us if you wish to present, or want usto present, our programs for your classroom. Note that some programs have accompanying Study Guides. We encourage public screenings with or withoutdiscussion...but please contact us in advance for permission, scheduling, publicity,etc. If you order a video and don't need to keep it, thinkabout making it part of our Lending Libraries . Sorry we cannot do credit cards, but we do take checks and money orders . If you work with an institution such as a library or university, we will accept a purchase order . Please write or call if you have any further questions.